We have great trouble leaving Nikki Dee these days because goodbye's upset her so much. It's hard to know what to do; often, we'll try to sneak out to prevent her from having a meltdown, but we don't want to lose her trust either. Yet, if we do leave with normal goodbyes she'll wail pitifully and want desperately to come with us. She'll find her shoes and bring them to us with so much hope in her heart. 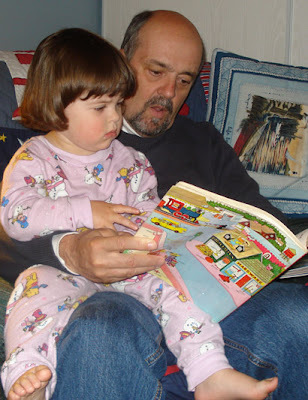 This sometimes works as it's really really tough to let this darling kid down. Yesterday, she somehow picked up the cue that we would be going in a little while because she was getting her shoes and jabbering about the car well before we had made any sort of tangible move. 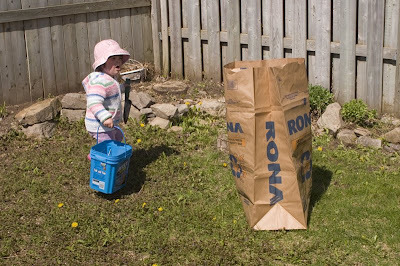 I'm not sure exactly what the cue was, but she's a very clever little girl to have figured it out. Mom and Amma got her out to the car before me, and this is the sight that greeted me when I arrived to take my place behind the wheel. 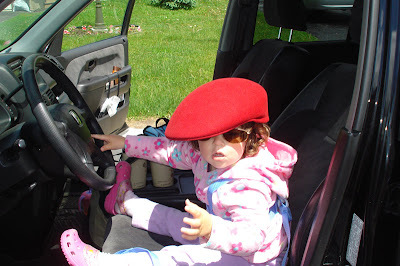 There she was sitting in the driver's seat wearing Buppa's jaunty cap and sunglasses. Oddly enough, even though she clearly wanted to come with us, she still had some mournful farewells for her parents. 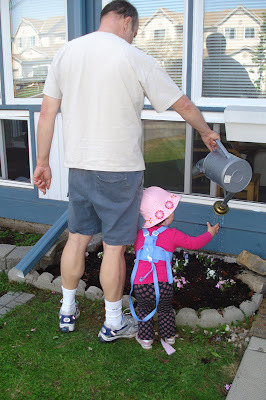 As we were driving up the street, there was a repeated, "Bye Daddy, bye mommy." 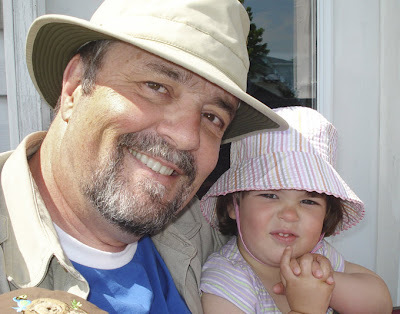 Soon, however, Cuppa started up her Raffi CD, and Nikki Dee smiled happily and got into her Raffi groove. Let's hear it for Baby Beluga in the Deep Blue Sea. I don't know how we're all going to be able to deal with partings in the future because I don't expect that it's going to get any easier. 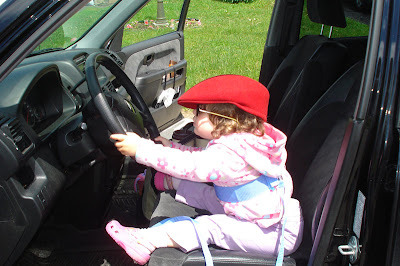 However, I do trust that she will leave the driving to me for about another fourteen years. It took almost a whole week, to lay some newspaper over this bed and then cover it with good soil. There are two reasons for the delay: (i) it's been raining buckets; and, (ii) we've been busy with company. Still on the agenda: more flowers and mulch cover. I want this to become a perennial garden, but perennials take time to mature. The old saying is that they sleep in the first year, creep in the second year, and gallop in the third. Whether that's completely true or not may be somewhat debatable, but I do know that whatever perennials we put in this year, there will have to be plenty of annuals to supplement them. That's what we've planted so far, and we'll have to put still more in. How do you love My Personal Stonehenge on the front lawn? When we moved here almost four years ago, the lawn was in terrible shape. For the most part, it remains in that state, but at last we are moving in the right direction — I think. We share this tiny space with a neighbour and, being the newcomers, didn't want to step on toes at first although the situation desperately required intervention, but since said former neighbor seemed to want to try to try his own rather ungreen hand at improving the situation — a task which resulted in an F grading — we kept our own council for the first two seasons. Last year, however, we became a little more assertive — gently so — and put the former and pathetic tree out of its misery, replacing it with the twig that you see in the photo down below. A least it's a healthy twig which, hopefully, has a promising future. We also elicited our former neighbour's permission to begin sowing white clover since normal grass doesn't seem to destined to flourish in this yard. The former tree, a Mountain Ash, is perhaps worthy of a digression. We are told that the previous occupant of our house thought its roots were too close to the surface, so he decided to hack them out, clever fellow that he was. Apparently, the tree was never the same after that although, for the life of me, I can't begin to fathom why. Fast forward to this year: the clover is coming along, and the new tree seems to be taking hold. 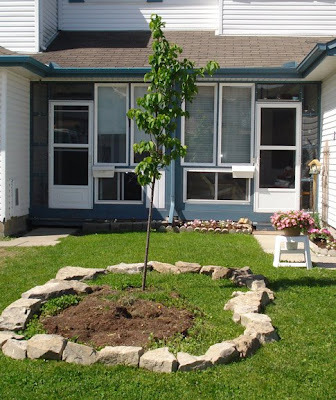 However, the new lilac tree was no longer in the original flower bed, and I thought the two should be brought into one as a flower bed circle in front of the tree seemed rather odd. So, one day early last week, Cuppa and I were out measuring an outline for a larger flower bed in order to know how many bordering stones to purchase for the newly envisioned bed when one of our new neighbours offered his two cents: our new neighbours being a group of young men — nice but young — an important caveat, I'm afraid. One of these stalwart fellows works for a paving company that apparently does some landscaping. He offered to bring home field rocks that they use. And so he did bring five here and dumped them on the lawn. But that was Wednesday, and by Sunday no further rocks had appeared. Young males, you see, would not necessarily see the importance of getting the job done rather than leaving gargantuan boulders strewn about willy nilly for half the summer. So, old AC and his decrepit spine, went foraging. Fortunately, as I have previously posted, rock is abundant here. Just find a construction site, and you'll find rocks aplenty, and since there's much construction going on locally these days, rocks are plentiful. Unfortunately, they're only available on a carry-out basis, so back and forth we went on Sunday, what passes for my back and me, trying to choose rocks that would fit together in some sort of semi sensible fashion. And this is the result. The next step will be to lay old newspapers down as a weed barrier before filling with garden soil and putting in some plants. I had a respectable perennial garden back in Sarnia a few years ago but was glad to take a hiatus from tending plants for these past several years, which partly explains why I distanced myself from proper grounds keeping. However, I am beginning to itch again — for more modest acreage this time, however. I suppose that annual bedding plants will take centre stage this year, but I hope to have a bit of perennial garden again in the near future. 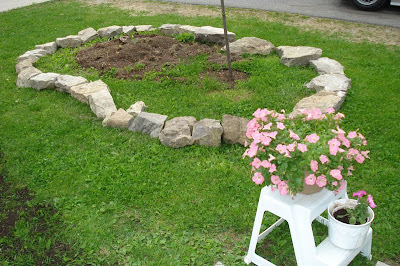 And that's the account of the little Stonhenge that lies upon my tiny front lawn ... where hopefully only young virgin mosquitoes will be sacrificed. Nikki Dee went to Daycare for the first time yesterday. 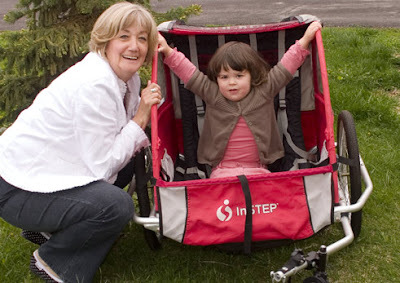 It's only for one day a week, partly because she's a very sociable child who thrives on having playmates around and partly because she's a very active munchkin, and with a young baby at home, Mom can use a little relief. Apparently, she loved it. One thing, however, is that Little Missy would not be indulging in the de rigeur nap that all of the ordinary children partake in. When you consider the song and dance (literally) that we have to go through to perhaps, just perhaps, get her down for a nap, it's not surprising that both she and the caregivers would pass on the nap. She's getting rather big for the Buppa to rock and dance with, but he loves this time with her and will miss it in a way when it's no longer the norm. This photo was from a recent day when we dropped over. 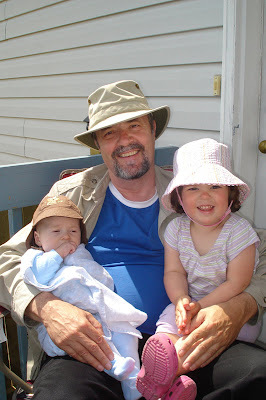 I was so hot that I borrowed the SIL's shorts for a while. Have I ever mentioned that I love this kid? I was supposing that everyone felt it whether their tv's were on or not the other night, but apparently not as blogdom has been quite silent on the subject. My tv was on, and I felt it acutely. It happened around ten o'clock when they announced the American Idol winner and that it was not Adam Lambert. Thud. I thought everyone would feel it wherever they were and whatever they were doing. Let me get this straight: the best singer-performer ever on AI, ever in all eight seasons, didn't win. Thud. While I've nothing against the winner, I must seriously question the sanity of the American public at large. Of course, when it comes to elections and a certain ex-president winning twice ... well ... sometimes it's hard to fathom ye Americans. I love you dearly, but you have been known to cause me to shake my head: to the point where I am wondering if it's possible to sue a nation for headaches and neck damage (lot's of kidding and attempted humour here folks — not to be taken too seriously). Did anyone note that Adam was pretty well the only AI singer who wasn't overshadowed by the stars with whom he sang? In fact, he more than held his own with both Queen and Kiss, didn't he? In fact, I might argue that he rather stole the stage. The funny thing is that I had a bit of a premonition on Wedneday: a premonition that my logical mind kept shaking off because it didn't make rational sense. However, the other guy is straight and cute and, apparently, that ensures a ton of votes. I have nothing against the other guy, mind you, because he has some chops too (whatever they are, but the judges use the term, and I am a terribly unoriginal follower), but really now. Lesson: never underestimate the ability of young lasses to dial the phone ... or their ability to disregard their ears while engorging their eyes and fantasies. On the bright side, for Adam, he doesn't have to record that song, and he can choose his own direction right away without having to represent the AI franchise for a year. 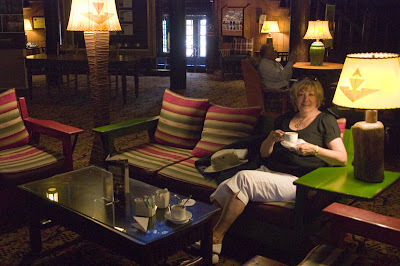 Almost a last minute decision, Cuppa and I travelled to the Willow Place Inn in Hudson Quebec for our official anniversary day, the 17th. After a long trip of shunpiking, we were rather tired and ready to relax. That's when I took this photo of Cuppa looking out the window. Perhaps I'll post pictures of the view or of the trip in general some other time, but this post is just about Cuppa and this picture. That's the original above, just as I took it with just a little cropping and mild adjusting. Then, I thought this one was worthy of experimentation. First, I applied a few filters to give it a painterly look (note: they're all somewhat enlargeable by clicking on them). 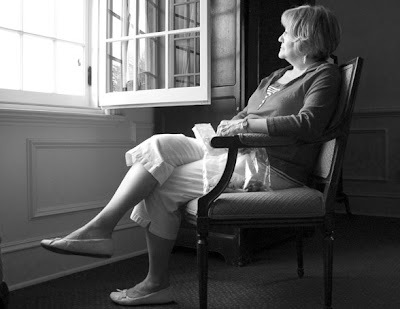 So, wondered I, what would it look like in black and white. Here's the answer. Finally, given the history and style of the Inn, I decided to go for sepia. Somewhat unusually, I like all versions of this one and find it difficult to pick a favourite although I'd probably opt for the original if severely pressed. What about you? 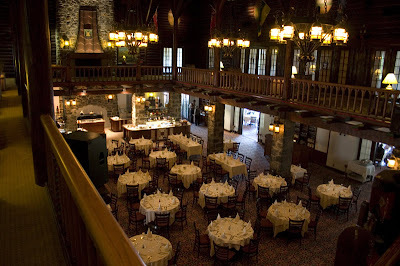 I imagine that I first heard of Chateau Montebello back in the 1980s when two important events transpired there — the G7 Summit in 1981 and the NATO summit in 1983. 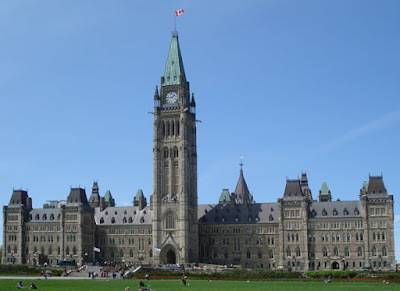 More recently, in 2007, Montebello also hosted the Trilateral Summit (or the Security and Prosperity Partnership of North America summit) consisting of Canadian Prime Minister Stephen Harper, Mexican President Felipe Calderon, and President George W. Bush. Back then and up until just a few years ago, I didn't realize that it was a hotel that is also open to the public. It was a neighbour in Sarnia who informed me that he stayed there one night and insisted that it was a place to be experienced. 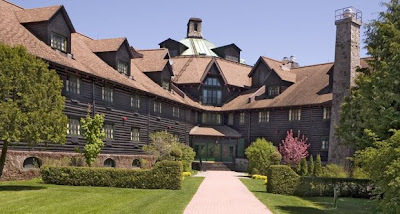 Back when we were formulating plans, we had briefly considered spending a night as part of our fortieth anniversary celebrations, but the price put a damper on that — we find $200 and up per night is a little steep. However, on Sunday, on our way to a more modest establishment in the neighbouring province of Quebec we discovered that one could freely walk the grounds and take a gander (gander as in peek, not a goose) inside. But it was a cool and windy sort of day, so we demurred. 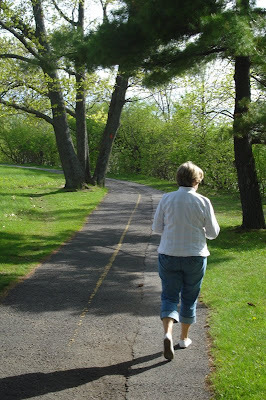 On Monday, however, the weather was delightful, so we took our curious selves out of our way to drive back to Montebello on the banks of the Ottawa River. I'm glad we did. Assuming that every excursion has a highlight, this was it for me this weekend. We walked into the property from the old railway station, which is now a tourist centre on the eastern edge of the very extensive grounds. The saunter from station to chateau probably only takes ten minutes, but, of course, it took us longer, for we couldn't not stop to see a few unexpected sites: such as a patch of red trilliums in the woods. 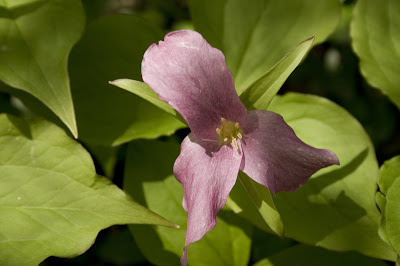 You might recall that it was just about a week ago that I mourned not finding any red trilliums locally. Well, we weren't looking for trilliums of any kind this past weekend, but we serendipitously stumbled upon a patch regardless. In point of fact, they were more pink or lavender (see photo below) than red, but there were several shades and a few plants were closer to the red that I have seen in pictures. However, I presume that whatever the exact tint of a specific plant, they are all red trilliums. 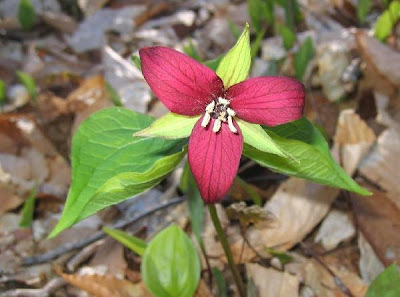 At least, my brief effort at googling didn't offer any other explanation, except to indicate that the red trilium may also be referred to as the purple trillium. 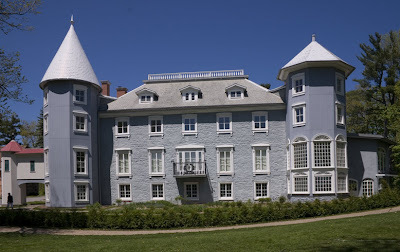 Another surprise: as we emerged from the woods but before we arrived at the chateau itself, we came upon a group of buildings which comprise the Manoir Papineau National Historic Site of Canada (manoir being the French version of manor). On the off-chance that I might wish to present more detail in a later post, I refrain from further comment but will offer you the photo below of the manor house of the eminent historical figure, Louis-Joseph Papineau. Apparently, it is sometimes open for visitors to browse for a fee, but not when we were wandering by. Several other buildings from his historical estate also exist on the estate. 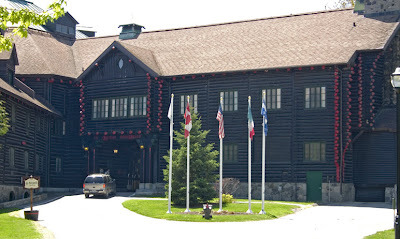 Finally, we came to the marvellous log, quintessentially Canadiana structure that is Chateau Montebello. The photo shows the centre hub from the outside and two of the four wings. 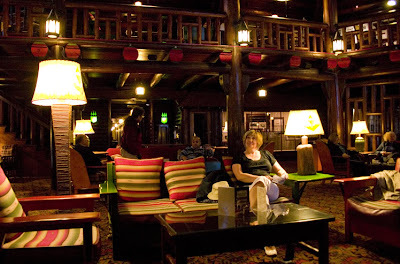 Built in 90 days in 1930, Montebello existed a private playground for the rich and famous for forty years until 1970 when it became accessible to the public as part of the Canadian Pacific chain of hotels. Almost three decades later it passed into the Fairmont empire before it was sold again three years ago although property signage indicates that it is still affiliated with the Fairmont chain. 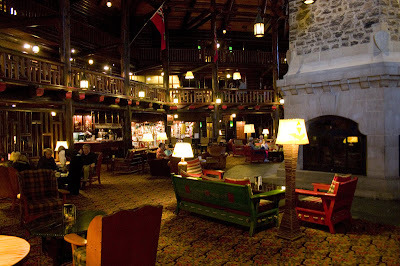 A distinctive exterior feature seen in the photo below is how the tips of the logs at the corners are painted red. 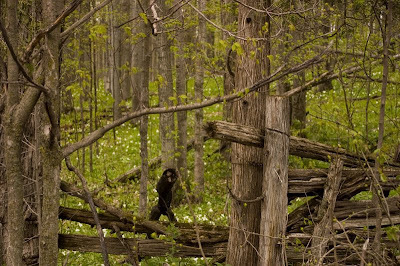 We wondered at this oddity at the time, but I believe it may have to do with Canada's colour being red. 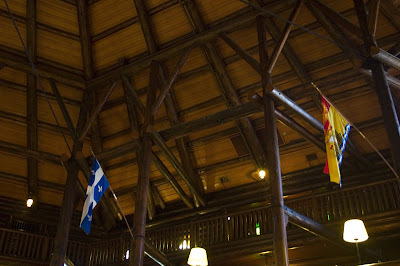 It's pretty impressive inside too in a rustic, Canadian sort of way. They keep it quite dark in the lobby, so my hand-held, slow-shutter-speed, high ISO photos are a bit grainy, but here they are regardless. 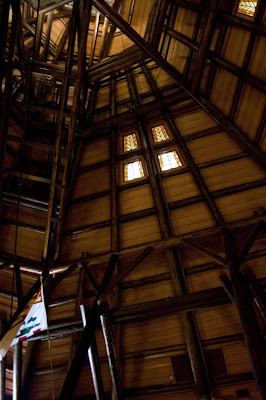 Let's start with two photos of the fine ceiling. The floor level view is also distinctive and impressive. The first shows part of the almost floor-to-roof stone fireplace while Cuppa relaxes and enjoys the ambiance in the second photo. We decided to savour the experience — literally — so we ordered a cup of coffee from the waiter with a lovely French accent. He was the one who filled us in on a bit of the history which I mentioned above. He was actually more informative than the website. The coffee was really, really good but at ten dollars for two small mugs without recourse to refills, we didn't stay around for seconds. The two cups weren't really ten dollars but over over seven with tax, so in a what the heck mood, I left the change for my ten on the table. For a few moments, drinking fine, expensive coffee in such a wonderful building, I felt a twinkle of what it must be like to be rich. And I suppose I am in my own way. Finally, here is Cuppa enjoying her expensive cuppa and a photo looking down into the dining room. Who knows, perhaps if my ship comes in (thanks for that expression, Dad), we'll go back for a night for our forty-fifth or fiftieth. Probably not, but I'm right chuffed to have been able to visit ever so briefly. Yesterday, however, we quite tuckered our little selves out. When I look back at it, I'm not sure why we were so tired by the end of the day, but we both were, even though we didn't get going until close to noon. 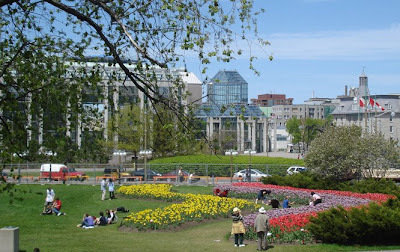 We took the back route into Ottawa and drove along Queen Elizabeth Dr, beside the Rideau Canal to see the tulip beds. Surprisingly, because it's late the the year, most of the beds were still in pretty good shape and made quite a wonderful display on a beautiful, sunny spring day. It's the final weekend of the annual tulip festival, but even though it's our fourth spring here, we've never made the jaunt into the city during this interval. 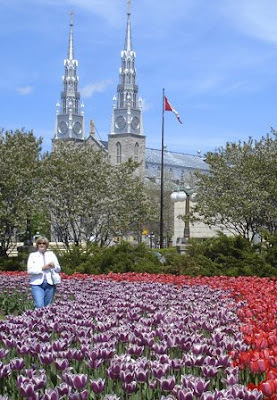 There are all sorts of goings-on — concerts, lectures, performances etc — but we stuck with wandering around the parliament buildings and Byward Market, enjoying the weather and looking at tulips and people. Lots of people down there on a Friday, including lots of kids of school age. Go figure. We usually park at the National [Art] Gallery and wander around from there. It's only a short walk to Majors Hill Park where we saw our first tulip bed (aside from those we had spied from the car on the drive in). So, I took Cuppa's picture, which shows that wonderful church in the background. I've been inside but can't recall it's name right now. 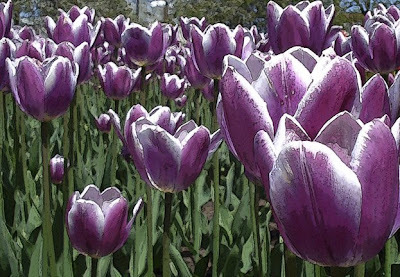 Here is a closeup of the purple and white tulips in this bed — in my faux art mode. The same bed again from a distance with the National Gallery in the background. 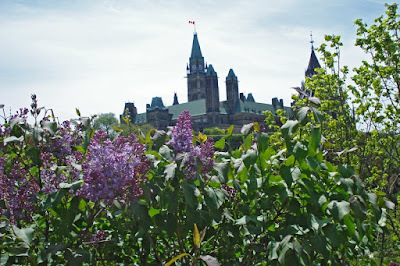 We began to ambulate from Majors Hill to Parliament Hill and found some lilac bushes beginning to flower (with the parliament building in the background in this photo). Once we got to The Hill we were a bit surprised that there weren't too many tulips there. But it makes sense because the large lawn must play host to The Changing of the Guard ceremony and the huge crowds that gather to watch the Canada Day concert and fireworks. Well, we walked along the Spark Street Mall and over to the Byward Market where we browsed and people-watched and ate lunch at the Blue Cactus Cafe. 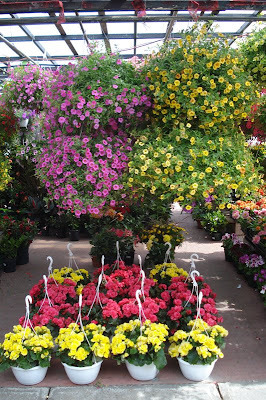 There are many flower vendors at the market. I'm not sure who buys these flowers to lug around, but people must because the vendors are here year after year. After a number of hours ambulating about the market we returned to our car and paid the $12 tab to leave the lot. We drove along the Riverside Parkway (no trucks, low speed limits) stopping once or twice to sit by the river and meander along the pathways. It was quitting time for the city workers and bicycle after bicycle whizzed by as we sat and looked about. In the following photo, Cuppa is walking along a path. 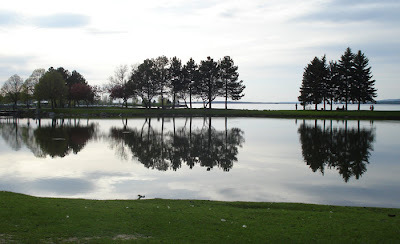 Next, we drove out of the Parkway to the lovely Andrew Haydon park, also along the river. As the gloaming and cooling began we enjoyed a picnic lunch while we watched people, ducks, geese and one groundhog eating from one lady's hand. We also looked to the horizon and enjoyed the view. And that was the day. I don't know why, because it wasn't a terribly taxing day, but we arrived home a very tired four-decade couple. 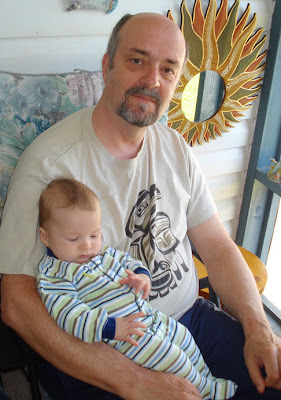 So, it was good to relax a little today (Saturday), for we're off on another adventure tomorrow (Sunday). Stay tuned. 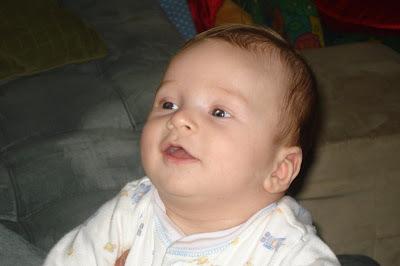 Because Mom had to keep an appointment with Nikki Dee, we began the day by taking care of Zachary. He was his usual boisterous self; in other words, he emitted tiny peeps on occasion. He was brought in napping, so we just left him in his car seat in the front porch until he awoke. Then, of course, I had to hold him and talk to him. How I hate that! After which Cuppa posed him for some pics on a baby quilt made by a dear friend. We have photos of Nikki Dee on this blanket too. 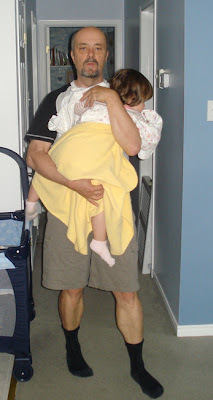 When appointments were done, Mom and Nikki Dee dropped by for lunch, and during this interval, Cuppa performed yet another version of The Miracle of getting the girl down for a nap. She's seems to be the only one who can accomplish this miraculous feat during the day although the rents manage fine at night. Go figure. 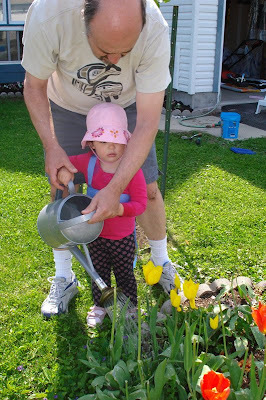 When she arose from her slumbers, she was more than pleased to assist with some gardening. 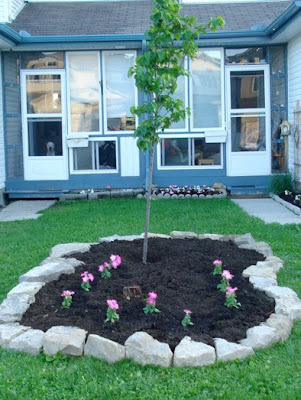 After adding a bit of topsoil to our two little beds, we planted some impatiens, and then watered diligently. This was the point at which ND decided that I required overseeing. 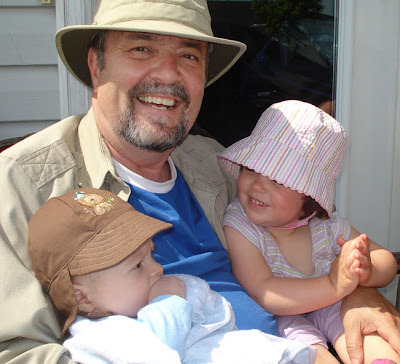 So far, I know Wednesday must seem like an ordinary day, but what could be better than spending time with the grands on one's fortieth anniversary weekend? 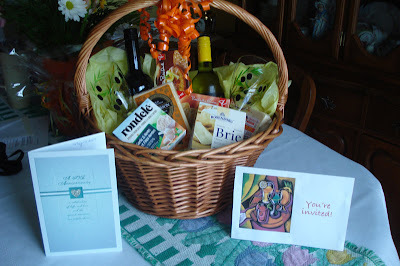 Then, the kids had us over for dinner, and the girls skyped in from Vancouver, and Cuppa and I were bestowed with gifts including the basket below. Yesterday, Thursday, we continued our sojourn into the celebratory albeit a little late because the weather was atrocious until mid afternoon. At that time, we turned our heads towards the city to catch the Star Trek movie, which Cuppa loved and I found okay. It was well done, but I think that although sci fi action flicks are Cuppa's cuppa, I don't think they're exactly my cuppa: okay but not glorious if you know what I mean. Regardless, a movie with popcorn and Coke followed by fantastic nachos at Kelsey's followed by a visit to Chapters followed by a fortieth anniversary snuggle is good. Very good. 1. Remember the fiddle clips that I had the audacity to share with you last week? Well, didn't one of the fiddlers at the jam find them on YouTube. They were meant to share here. Who knew that somebody, somebody who I know, somebody who could actually play would find them? Anyhoo ... I went to the jam last night, and, as luck would have it, they called a lot of tunes that I knew. Alas, as luck would have it, I pretty well ran out of tunes that I could call when it was my turn. On one occasion I called Neil Gow's Lament, a beautiful piece that goes slowly — slowly enough that my timing was not the best, and ... and ... well ... I don't imagine that I'll call that tune again. 2. 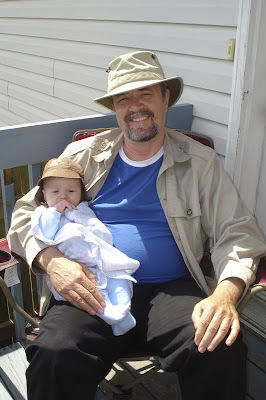 On Mothers Day (which I refuse to apostrophize or apostrosize? ), Cuppa and I received the joint present (my half for Fathers Day) pictured below so we can pull grandchildren behind us when we cycle. The only trouble is that it's Buppa's aging legs that have been designated to do the pulling. It's good for me, right? Right? 3. Zachary had to have some tests at the hospital yesterday. There were some concerns about kidney and spinal problems. Apparently, however, all is well. I had visions of the poor little guy having to undergo operations or of having his quality of life affected or both. 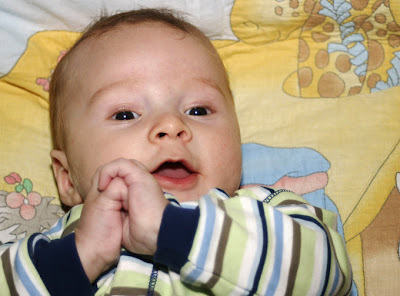 I would be so sad for such a happy and contented baby boy. Instead, I'm just relieved. Phew! 4. Nikki Dee slept over on Sunday night because Zach had to go to the hospital early. As I've mentioned before, she's a going concern, but she does seem to enjoy sitting for a bedtime story, even if the main focus is on rapidly turning the pages. Have I ever mentioned that I love this kid? 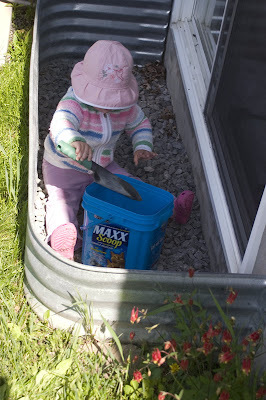 ... although some might question the value of weeding stones by our basement window. 6. Periodically, I try to get arty with my photos. Most of these attempts are better left un-attempted. 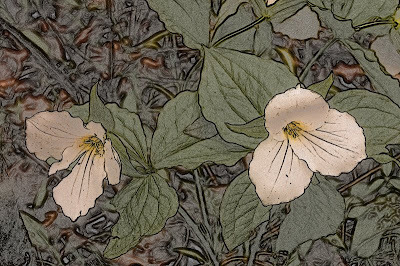 Here, I try to gild the lily (almost literally) by playing around with one of my recently posted trillium pictures. 7. 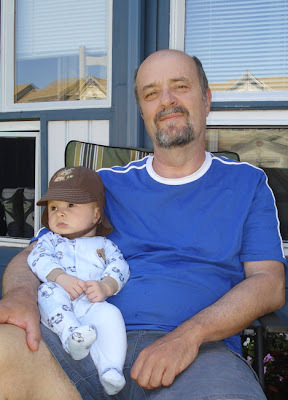 Cuppa and I will be celebrating our fortieth anniversary this coming week, a long weekend here in Canada. While I may blog this in more detail later, I cant be sure whether I'll find the time, so I thought I'd mention it now. Time does fly, but I've so enjoyed life's trip with this great lady who's my best friend. Our plans are loose and not extravagant. They're loose because one can never count on the weather at this time of year. They're not extravagant mostly because we're not extravagant folk, but also because we hope to make an anniversary trip to the west coast later in the year. Since the girls will be visiting here shortly, it doesn't make any sense to go now. 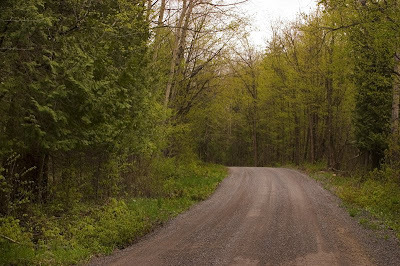 There weren't a lot of active options on a cloudy and cold Mothers Day, but we knew the trilliums were out and decided to ramble around some of the local rural roads to have a look. We found many many clumps nestled in the woodland fringes just off the edges of the roads. This was one of the larger. 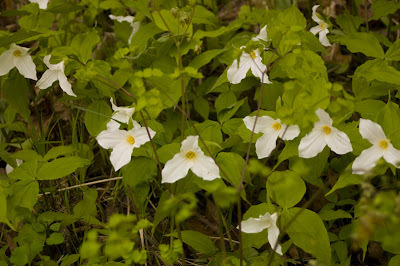 There's no detail in the following photo, but there are sure a lot of white splotches, each being a trillium. 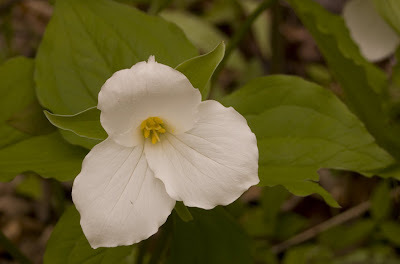 For those who don't know here is what the trillium, Ontario's provincial flower, looks like up close. They bloom for only a short while each spring, and they're only found in less cultivated, rural areas. 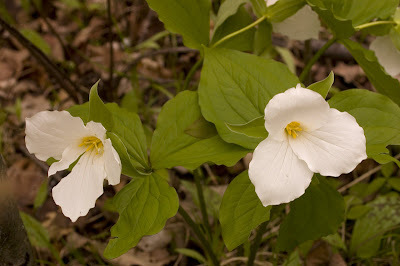 There are also red trilliums, but I have never seen one in the wild. In fact, I'm not sure that I have ever seen one anywhere except in pictures. So, here's a photo that I found and stole. As far as I know it isn't copyrighted, so I don't feel too bad about the theft.